.36 Caliber Navy "Remington Teardrop"
The .36 Caliber Navy or “Remington Teardrop” has been recovered in large numbers from cavalry sites in the Western Theater of the Civil War. The bullet is much less common in the Eastern Theater of Operations. 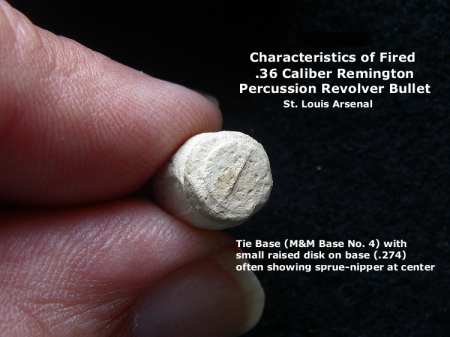 Recently, Dean Thomas in the third part of his “Round Ball to Rimfire” book series documented that the origin of this .36 Navy bullet can be traced to the federal arsenal at St. Louis. The St. Louis Arsenal produced more revolver cartridges than any other federal arsenal during the War. According to Thomas, the arsenal probably converted .36 caliber pistol balls to the more elongate shape (shown at the right) for “cap and ball” pistols as early as 1855. This was about the time that longarms were being converted and manufactured to receive the new “Minié bullet” rather than the round ball. Unfortunately, Thomas also discovered that no arsenal extant records that indicate how many or for how long this “elongated ball” style was produced at St. Louis. The unusual bullet shape probably had some aerodynamic qualities that might have improved its accuracy and the shape facilitated chamber loading over the round ball. After the cylinder was placed in the revolver frame, the bullet and powder were squeezed together with a loading lever making a ramrod-like impression on the nose of the bullet. The tight fit of the bullet to the chamber wall/powder prevented the bullets from falling out of the cylinder and also prevented bullets from dislodging out of the cylinder from the recoil of the revolver when fired. Six cartridges were wrapped together in a small paper bundle along with eight percussion caps. This arrangement made it easy for cavalry to carry cartridge packages. One of the first to document the existence and origin of this bullet was W. Reid McKee and M.E. Mason’s book “Civil War Projectiles II with supplement”. 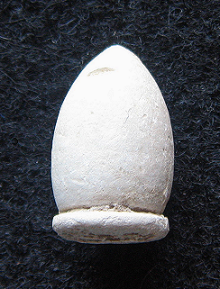 The .36 caliber Teardrop or “elongated ball” was described with a diameter of .389; a length of .610; and a weight of 142 grains that was used by both sides of the War (p.27, M&M 99). It was described as “Unknown for revolver”. Later in the supplement (p.1), M&M 99 was corrected to be used in the Remington .36 Navy revolver. This might have been where the St. Louis Arsenal .36 caliber Navy bullet first became associated in print with Remington Arms. More recently, Dean Thomas has studied the revolver cartridges of the federal arsenals and had found three examples of the “St. Louis Arsenal style” elongated ball. The dimensions of these bullets are shown below. Bullet 728 appears to be the closest match photographically to M&M99 but the dimensions do not match. 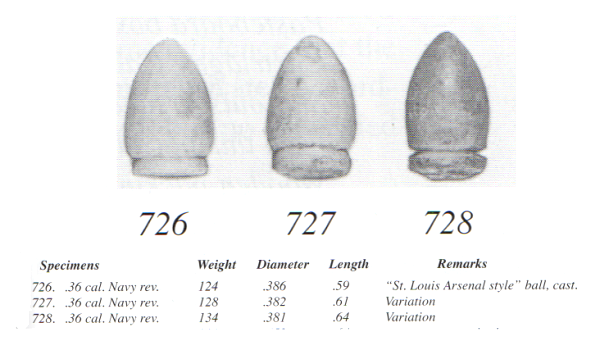 Examples of the .36 Navy Revolver bullets manufactured at the St. Louis Arsenal. Source: “Round Ball to Rimfire – Part Three” by Dean Thomas. James and Dean Thomas have published another example of the .36 Navy Revolver bullet (T&T38, p.8) in their “Handbook of Civil War Bullets and Cartridges”. Tom Henrique also has three examples of the .36 Navy at his website. 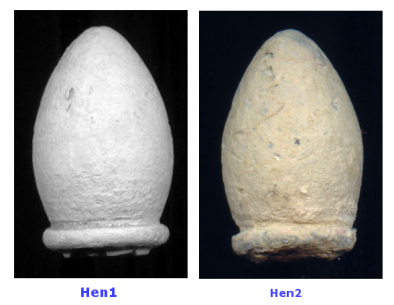 Hen3CS is a possible Confederate manufacture found in Virginia. The measurements of these specimens are shown in the table below. Previously published attribute values for the .36 Navy St. Louis Teardrop. There appear to be some differences in these measurements. For example, specimen M&M99 does not appear to agree with the other values in terms of weight. The author and his partner have recovered over 20 specimens from a single cavalry location in Missouri. Nineteen of these appear to be “drops” and would be of value to compare with the previously published examples. While physically in the field they were all the same, there was considerable variation in their diameter, weight and length as shown above. 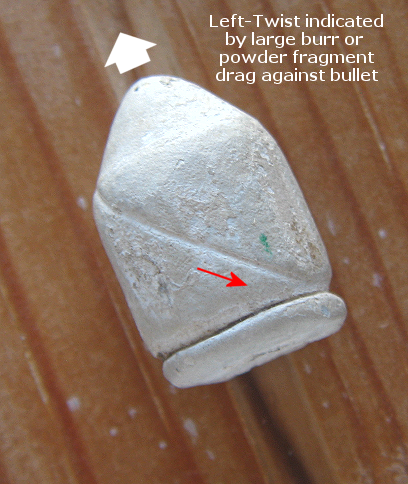 Two of the bullets appear to be miscast as displayed a clear casting remnant running along the side of the bullet as seen below. Casting remnant running down the side of the bullet produced when the sides of the casting mold are not parallel and offset to each other. How close do the nineteen St. Louis Teardrops match the published attributes? The weight of the 19 specimens of the St. Louis Teardrop was measured in grains by a 100 gram digital weight scale. 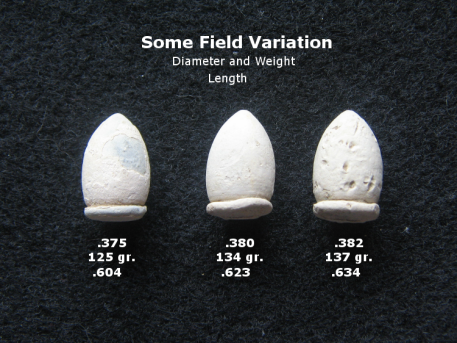 The bullet length and diameter were measured by digital caliper. Ten measurements of each attribute were taken on each bullet by slowly rotating it to a new measurement location on the bullet. 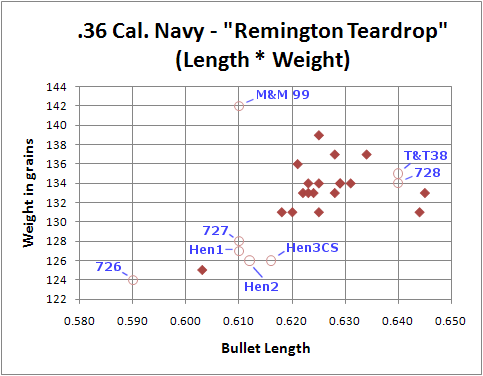 Also plotted were the previously published attribute values for the .36 Navy St. Louis Teardrop. These values are plotted on the chart as open red circles. Firstly, one can see that the values of M&M99 are not near the other values. This suggests a measurement error or mistype of the data. Of the 19 specimens, most of the bullet weight data appears to be clustered around 134 to 135 grains and this is the same weight values published for T&T38 and T728. The single exception is the specimen with a weight of 126 grains that is shown on the left side of the field variation figure. This specimen also appears to be short in measured bullet length. This sample was measured several times and errors in measurement are unlikely. The weight and length difference might be explained by loss of external patina (see field variation figure) and perhaps an internal casting bubble can account for the anomalies. 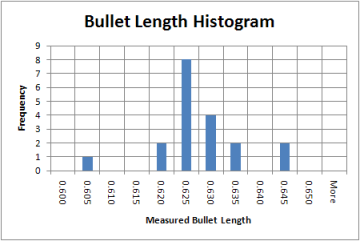 The histogram of measured bullet length is clustered around 0.625 to 0.630. This does not correspond with the published values of 0.640 for T&T38 and T728. Histogram of nineteen St Louis Arsenal Teardrop bullet lengths recovered from a single cavalry location in Missouri. 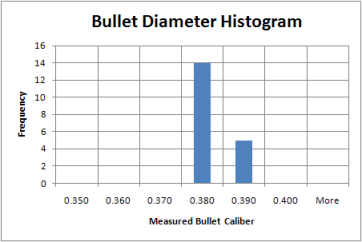 To complete the bullet measurements, the bullet diameter histogram is shown to the left. As expected, this histogram shows the smallest variation. This compares favorably with the published values for this bullet. It should also be noted that the Henrique specimens cluster around the values of the T277 specimen in the weight to length plot. Hen3CS was recovered from a Confederate site in Virginia. Physically Hen3CS looks like T727 as shown below. However, Hen1 and Hen2 more closely resemble T728 and T&T38 as shown below. Henrique’s specimens Hen1 and Hen2 look like Thomas’ T728 and Thomas and Thomas T&T38 but do not agree with their weight and length. 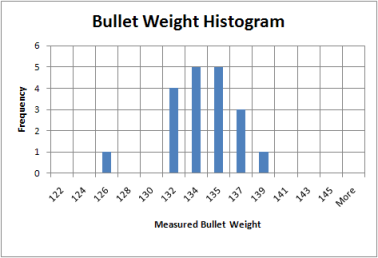 See bullet weight by bullet length plot above. One of the bullets found by the author, merits further discussion. It was “fired” and appears to be of significance to the name first applied to this bullet by McKee and Mason. Its forensic characteristics are shown below. This bullet demonstrated the tie base described as M&M Base No. 4 with a small raised disk on the base. This is a casting sprue and a sprue-nipper remnant is evidenced across the sprue disk as a line across its center. The disk measured 0.274. Technicality, any .36 Navy percussion revolver could fire the St. Louis teardrop elongated ball. The fired Teardrop to the left had five unequal-sized land and groove impressions and a weight of 125 grains. The best proof that this bullet was fired from a Remington would be to match the lands and grooves in the rifling of the any Remington Navy revolver to the rifling impressions on this bullet but an exact match to the dimensions of the Remington Navy rifling and cylinder ram were unavailable to the author. But the land and groove number matches the Remington. There is some circumstantial forensics. Robert M. Reilly’s “United States Military Small Arms 1816-1865” describes the various .36 Navy revolvers commonly used in the Federal service during the Civil War. These Navy-caliber revolvers are listed in the table below with their rifling characteristics. 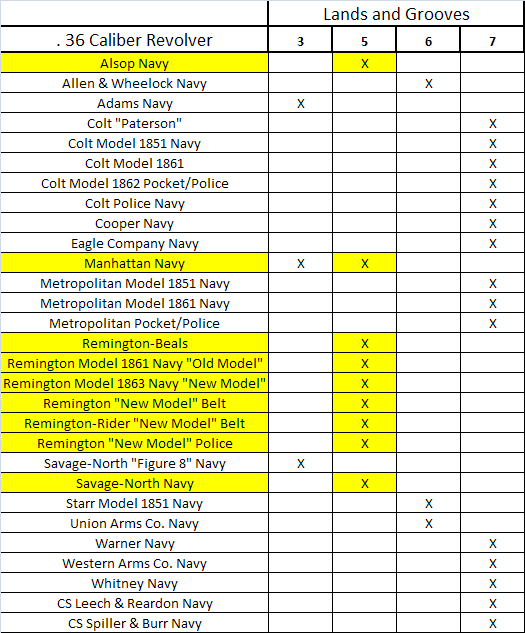 Those described with the same 5 lands and grooves as the Remington Navy and the fired bullet are outlined in yellow. Six out of the nine Civil War revolvers with this type of rifling were made by Remington Arms. The table also shows that Colt never made a 5-groove Navy revolver and preferred to use 7-groove rifling. To the author, this suggests that the bullet was fired by a Remington Navy revolver or some Remington-copy weapon such as the later model of the Manhattan Navy or the Savage-North Navy. Almost 78,000 Manhattan Navy revolvers were produced but only 36 were directly purchased by the Federal government. Robert Reilly believed that thousands of these weapons saw their way to field service through private or state purchase. On the other hand, the Savage-North revolver (a definite non-Colt look alike) was made only from 1861 through 1862 with a total production of only 20,000. Most of these revolvers were made under Federal contract. The Union purchased fewer than 12,000 of these for use by its cavalry units. Savage Navy revolvers were issued to the 1st and 2nd Wisconsin; U.S. Volunteer Cavalry regiments and 5th Kansas Volunteer Cavalry while the State of Missouri issued 292 Savage revolvers to its Missouri Enrolled Militia units. The remaining revolvers were purchased by private means and shipped to the Confederacy for use with the 34th Battalion of Virginia Cavalry; the 35th Battalion of Virginia Cavalry; the 11th Texas Cavalry; the 7th Virginia Cavalry and 7th Missouri Cavalry. The United States Navy also purchased 800 Savages during 1861 for use on its ships. Since the fired Teardrop bullet below was recovered in Missouri, it is possible that it was fired from something other than a Remington. The only way to tell is to match the bullet rifling impressions with the actual revolver rifling. Source: “United States Military Small Arms 1816-1865” by Robert M. Reilly. Highlighted are percussion revolvers used in Federal service with 5-groove rifling similar to the fired bullet found by the author. The Confederate Leech & Reardon and Spiller & Burr information was added to the table by the author. To further investigate whether other Navy-caliber revolvers could have fired the Teardrop, the author back-searched his collection and found another fired Teardrop from another Federal cavalry site in Missouri. 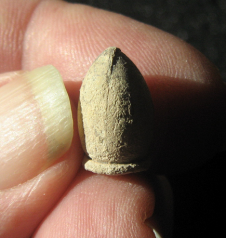 This bullet possessed 7 unequal-sized land and groove impressions and a larger diameter ram impression on its nose. It is tempting to suggest that this bullet was fired from a Colt or a Colt/Whitney lookalike revolver. Using the table above, 5 of the 13 manufacturers with 7 groove rifling were Colt but an exact match to the original rifling was unavailable. 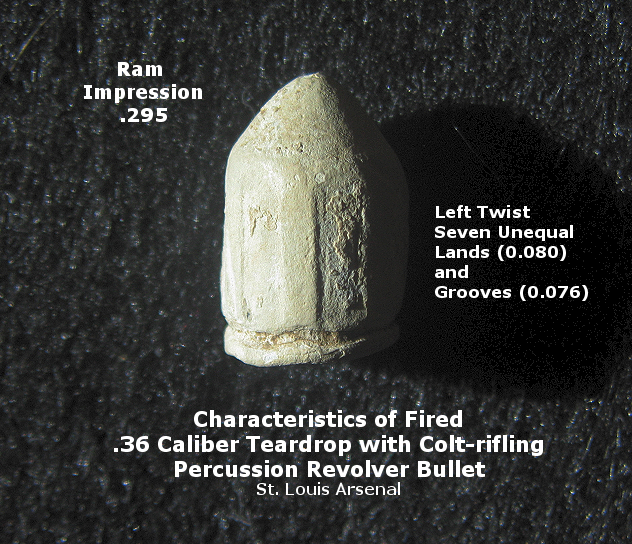 A second Teardrop from the author’s collection shows Colt-type rifling as opposed to the Remington-type rifling found on the first bullet. 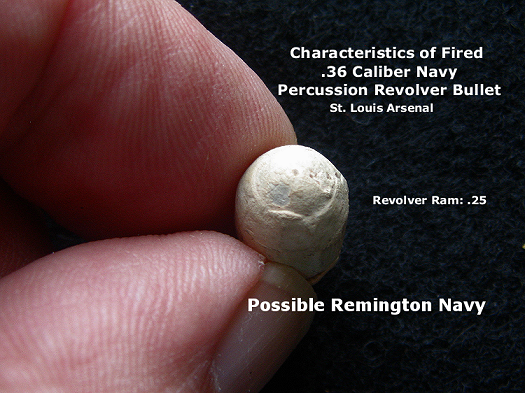 This suggests that multiple Navy-caliber revolvers were capable of firing the St. Louis Arsenal Navy Teardrop cartridge. 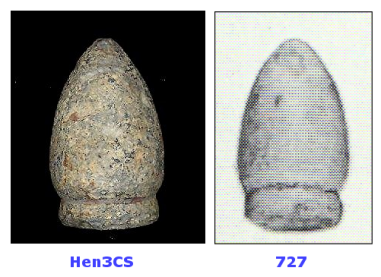 RIGHT: Same bullet showing firing scrape against barrel burr or powder fragment. Trace of this against side of bullet indicates left twist as bullet dragged against it leaving chamber. Pioneer work of the records of the St. Louis Arsenal by Dean Thomas has shown that at least three variations of the Navy-caliber Teardrop bullets were manufactured prior to, and, probably during the Civil War. The attribute values were compared with field specimens. 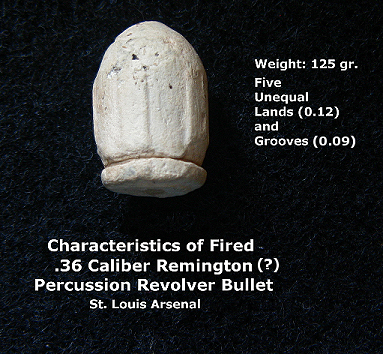 The study of two fired bullets of this type with two different rifling impressions suggests that multiple Navy-caliber revolvers were capable of firing the St. Louis Arsenal Navy Teardrop cartridge. Often it is not possible to count the number of lands and grooves on a Navy-caliber Teardrop due to bullet deformation. However, it is possible to calculate the total number of lands and grooves on a Teardrop by measuring the width of a single land-groove width set and using the table below that was derived from this study of 23 Teardrop specimens. This will aid in the identification of the firing weapon. For example, if the land-groove width set measures between 0,166 and 0.174 then the estimated total numbers of lands and grooves on the bullet is 7 and the bullet has been fired from Colt or Colt-lookalike revolver. If the land-groove width set is between 0.233 and 0.244 then the estimated total number of lands and grooves is 5 and the bullet has been fired from Remington or Remington-lookalike revolver based upon the chart of lands and groove numbers for various revolvers found above. W. Reid McKee and M.E. Mason, Jr., “Civil War Projectiles II, Small Arms and Field Artillery with supplement”, 1980, Publisher’s Press Inc., 192 pp. and 11 pp. supplement (ISBN 0942365089). Dean S. Thomas, “Round Ball to Rimfire, a history of Civil War small arms ammunition – Part 3 – Federal Pistols , Revolvers & Miscellaneous Essays”, 2003, Thomas Publications, 478 pp. (ISBN 1577470923)..
Robert M. Reilly, “United States Military Small Arms 1816-1865”; 1970; The Eagle Press, 275 pp. (ISBN 140882270192). James E. Thomas and Dean S. Thomas, “A Handbook of Civil War Bullets and Cartridges”, 1996, Thomas Publications, 82 pp. (ISBN 0939631946). Norm Flayderman, “Flayderman’s Guide to Antique American Firearms and their values – 7th Edition”, 1998, Krause Publications, 654 pp. (ISBN 087349198x).